Wash the fruit and roll it on a hard surface to loosen its juices. 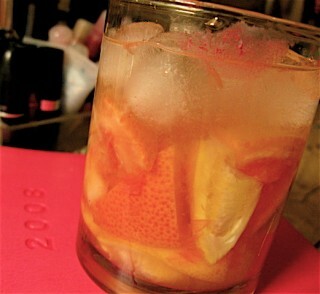 Cut the citrus into pieces and place them in an old-fashioned glass. Sprinkle with the sugar and crush the pieces (pulp side up) with a pestle. (Wooden pestles are ideal here, but you can use almost anything to crush the rind and release the juice.) Find a happy medium between gentle and tough when muddling.You don’t want to bruise the rind or it will release bitter oils. Add the Cachaça and stir to mix. Add the ice and stir again. Wet the rim of the martini glass with lime.Dip into a plate of salt.Shake off excess salt, and prepare the drink.Shake all the liquid ingredients together with ice and strain into a martini glass.Garnish with a twist of blood orange. 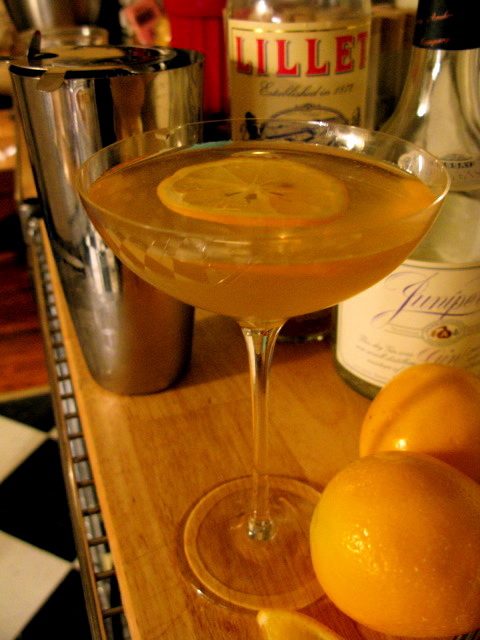 Shake all the liquid ingredients together with ice and strain into a martini glass.Garnish with a slice of Meyer Lemon.I used a coupe-shaped martini glass as I thought the sloped sides a better compliment to the angles on a Vespa, and the man who sits behind its wheel. 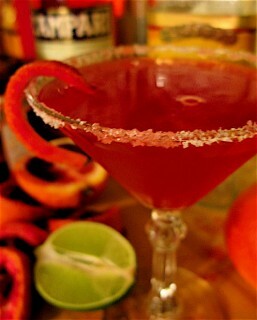 I believe the grapefruit concoction stemmed from a recent New Year’s party in Buf. I remember downing quite a few. They were yummy. The Meyer lemons and the very pink grapefruits – oh I can still taste them. Keep on blogging.